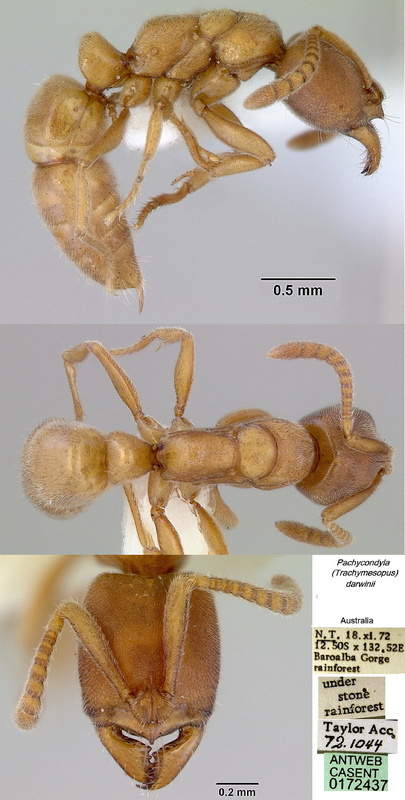 Genus Parvaponera defined by Schmidt & Shattuck (2014: 199) with P. darwinii as type species. Diagnosis. Workers of Parvaponera can be separated from other Ponerinae by the following combination of characters: eyes small (2-4 facets) or absent, mandibles short, without a basal pit or groove, propodeal spiracle generally elongate or slit-like (oval or nearly circular in a few species), ventral apex of the metatibia with one pectinate and one simple spur and subpetiolar process triangular and with an anterior fenestra and/or a pair of teeth. They are most likely to be confused with Centromyrmex, Hypoponera or Ponera. 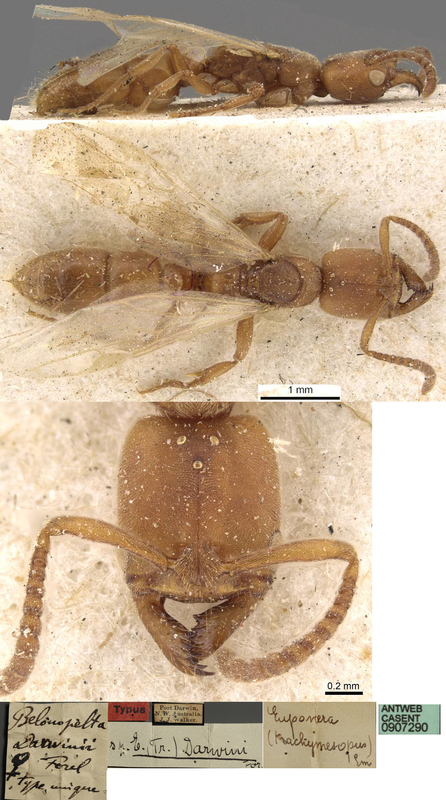 While both Centromyrmex and Parvaponera have reduced eyes, Parvaponera lacks pusher-setae on the tibiae as found in Centromyrmex (although they are present on the mesobasitarsus in some species of Parvaponera) and has a much more complex subpetiolar process which possesses either an anterior fenestra or posteroventral teeth, both of which are lacking in Centromyrmex. While superficially similar to Hypoponera and Ponera, Parvaponera has a pair of spurs present on the metatibia while only a single spur is present in these genera. Note: The African forms seem almost certainly to be a different species. I show what evidence is available at the bottom of this page but without images of africana offer no firm conclusions. I note that Schmidt & Shattuck write of species occurring in Tropical Africa but provide no information other than "P. darwinii africana (Forel, 1909) DRC (comb. nov.)" and do not list lamarki anywhere in their review. The form rufotestaceous also is not mentioned anywhere by them. 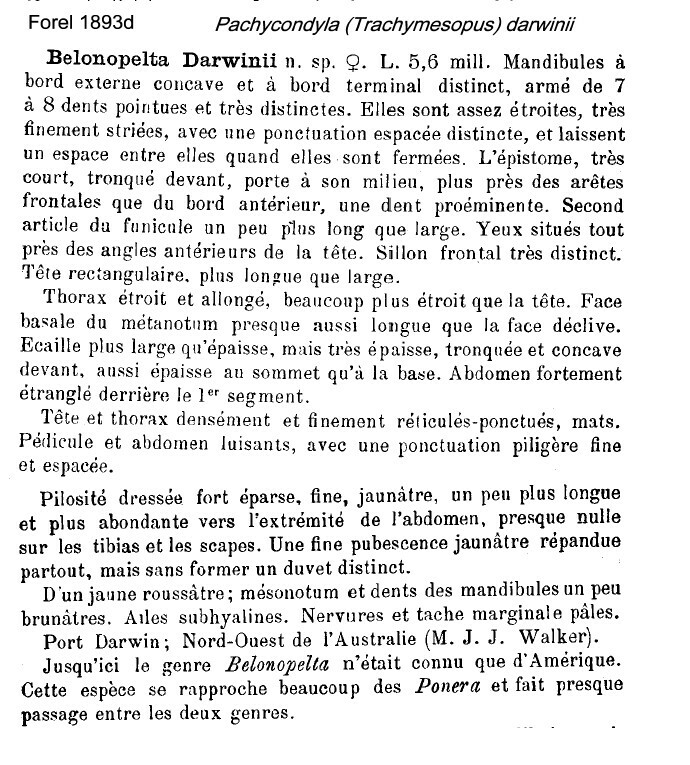 Forel's (1893d) description of the queen is at . Forel's (1900d) description of indica is at . Forel's (1909b) description of africana is at . 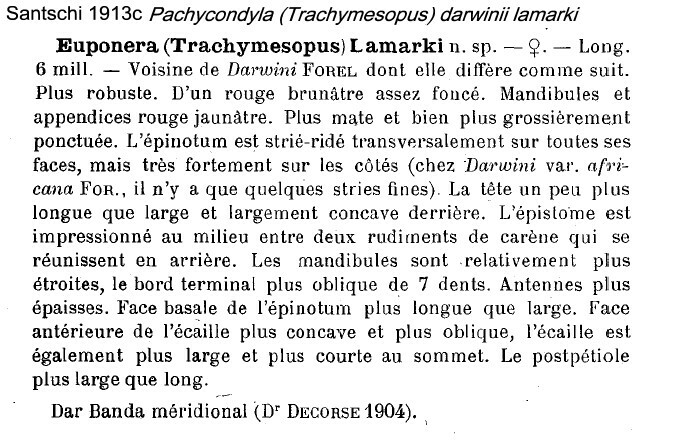 Santschi's (1913c) description of lamarki is at - Brown (1963: 6) synonymizing this with darwinii described it as a large variant (TL 5.6 mm). Donisthorpe's (1943b) description of rufotestaceus is at . Terayama (1990: 897) - see - described what he felt was the previously undescribed worker. The photomontage at the bottom shows a worker presented on www.Antweb.org that is from the type area around Darwin, Australia. 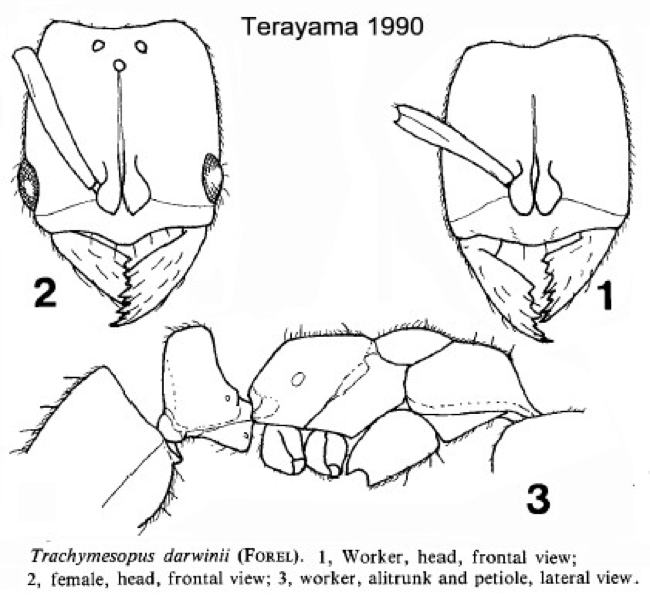 Generally that and the Terayama drawing are similar but the Australian specimen clearly shows the prominent median tooth on the anterior margin of the clypeus that was emphasised by Forel (1893d). The photomontage of the type queen is collated from http://www.antweb.org/specimen.do?name=casent0907290. The photomontage is collated from http://www.antweb.org/specimen.do?name=casent0172437. It is labelled as P. darwini. Australia: Northern Territory: Baroalba Gorge; 12�30'00"S 132�31'12"E Collection Information: Collection codes: ANTC6642 Collected by: R.W.Taylor & J.E.Feehan Habitat: rainforest Date: 18 Nov 1972 Method: under stone. 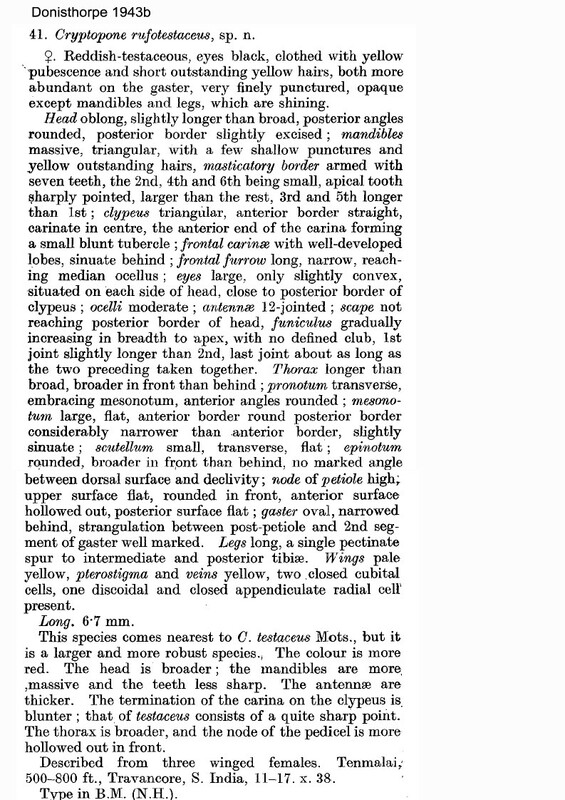 The queen of africana, as described by Forel (1909b), has - head almost as wide as long; petiole node less truncated than the type, more rounded posteriorly, upper anterior border less clear and, in profile not forming an slightly acuminate angle (seen in the type, but as in indica). Rest as variety indica, and even more so var. madecassa, which has a similar petiole node, but not as rounded as africana. Specimen from Za�re, Luki, Lower Congo, by Dr. A. Jullien. It seems quite possible that these all were actually Pachycondyla (Trachymesopus) fossigera. That is generally similar, although darker than the yellowish darwinii type form. It also is distinctly larger TL ca 6 mm cf darwinii TL 4.3-4.9 mm, and has a broader head CI 98-100, darwinii CI 92-93. Alternatively, the distribution suggests that it is a tramp species, moving aboard ship, and mostly known from the female form only but that would not account for the records from well inland in Mali. The photomontage of the lamarki type queen is collated from http://www.antweb.org/specimen.do?name=casent0915260. This is some 25% larger than the type form. The head is a different shape and the scapes reaching the occiput rather than falling well short.